The security co-operation in East Asia that has helped maintain peace in the region for decades is being challenged by changes across a broad front. China’s rise, combined with Japan’s move away from the constraints placed on it after World War II, as well as the relative shift in US influence, are triggering a re-examination of the security architecture of East Asia and a debate over what multilateral arrangements would best secure the future. These changes come at a time of continuing challenges to regional security posed by issues such as North Korea’s nuclear program, the Taiwan strait, territorial disputes, a build-up of arms and by the emergence of non-traditional security threats such as energy security, climate change, terrorism and transnational crime. Elsewhere in this issue, we feature a debate triggered by Toyota’s recent problems and ask whether Japan’s multinationals are losing their edge. We also include a comprehensive look at how Asia has weathered the global financial crisis; an engaging essay on what Asia can learn from Silicon Valley; a call for America to take Asia seriously as an export market; a plea for US President Barack Obama’s administration to take engagement seriously; an unsettling look at the displacement of Vietnam’s farmers; an argument for taking seriously the ethno-religious tensions in Southeast Asia; and reasons why the city of Chongqing should rethink its growth strategy. Also, we include reviews of two compelling books on Singapore and Malaysia. We are also pleased to announce two developments that will enhance Global Asia’s growing reputation as one of the world’s leading forums for discussion and debate on international policy issues relating to Asia. 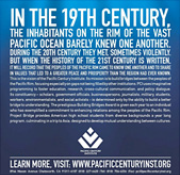 The East Asia Foundation, publisher of Global Asia, has entered into a co-operation agreement with the Los Angeles-based Pacific Century Institute (www.pacificcenturyinst.org), which will help us produce and distribute the journal in North America. We look forward to a fruitful collaboration with PCI in the years ahead. In addition, beginning with this issue, we have named three new regional editors to assist in expanding and deepening the range of topics we cover and the contributors who write for us. They are Cheol Hee Park, Associate Professor in the Graduate School of International Studies, Seoul National University; Wang Yong, Professor at the School of International Studies and Director of the Center for International Political Economy, Peking University; and John Swenson-Wright, Associate Fellow, Asia Program, Chatham House. We are delighted that they have agreed to join us in pursuing the mission of Global Asia. 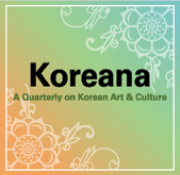 If you would like to contribute, please send your articles or proposals to us at editorial@globalasia.org. We welcome any inquiries. In a huge and complex region, the challenge of building a comprehensive security architecture is daunting. East Asia has pressing problems on its doorstep — North Korea, territorial disputes, economic imbalances — and longer-term desires to prove itself as a powerful bloc. As the essays in this package show, a plethora of ideas, institutions and initiatives are bent on achieving this. But which are the ones that point to a realistic way forward? Those who worry that China's spectacular economic growth will lead to a more aggressive role, fail to understand how dominant domestic issues are in China's security calculations. 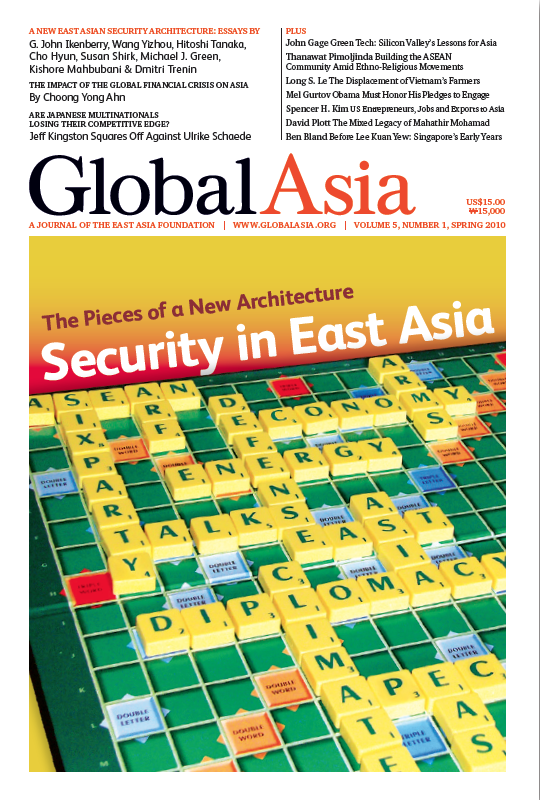 The rapidly changing security landscape in East Asia in recent years has created growing pressures to re-examine the existing security architecture for the region and seek new ways of meeting future challenges. Despite the existence of numerous institutional arrangements, Japanese academic Hitoshi Tanaka argues that a new security architecture will require further institution-building and a deepening of dialogue among the region's major players. Building a multilateral security architecture in Northeast Asia is essential for enhanced peace and stability in the region. South Korea, Japan and China will need to find ways to converge their interests further and deepen co-operation with each other. If the US were to play a more active role in promoting and building multilateral arrangements in East Asia, it might be surprised by how effective multilateralism could be in tackling even sensitive foreign policy and security issues. Can US and European leaders cast aside their moralistic approaches to international relations and become as pragmatic as their Asian counterparts? 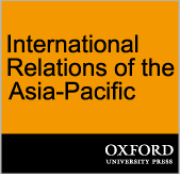 The Asia-Pacific region has largely been defined as Pacific Asia. Dmitri Trenin, director of the Carnegie Moscow Center, argues that Continental Asia deserves greater attention because of its potential for both conflict and co-operation. Are Japanese Multinationals Losing Their Competitive Edge? There has been a fundamental and strategic shift in priorities for Japanese firms, to focusing on core strengths, emphasizing profits, and cornering the market in less visible but high-value 'upstream' technologies - where Japan still tops the world. Measures taken since the financial crisis of 1997-98 to strengthen the financial system and reshape economic policies helped Asia withstand the latest global crisis much better than the US or Europe. Legendary IT innovator and venture capitalist John Gage argues the region could benefit by studying the unique culture of Silicon Valley and the innovations it spawned. US was chiefly seen as an export destination for Asian products, but US policy makers are beginning to see that future job growth will require businesses to begin to see Asia as a vibrant and natural export market for US products. Barack Obama's presidency raised high hopes that the US would adopt a policy of engaging adversaries such as North Korea and Iran, but more than a year into office, Obama has so far failed to take the only approach that holds a real promise of success. As Vietnam's economy continues to industrialize, the sensitive issue of land rights threatens the very existence of rural communities and could put farmers on a collision course with the government over their future. The focus of ASEAN community-building has been on greater economic linkages and trade. However, the vision of ASEAN is at risk if simmering ethno-religious movements are not confronted. Chongqing at a Crossroads: Can It Support Sustainable Industries? Urban planning consultants look at what the western Chinese megalopolis of Chongqing is attempting to do and what else it must do to pull back from an environmental brink, attract investors and human talent to provide a basis for future development. Australian journalist Barry Wain's biography turns out to be a remarkably balanced portrait of a political leader who has, in turns, been vilified by his critics and idolized by his supporters, both at home and abroad. Lee Kuan Yew dubbed his memoirs The Singapore Story, and many Singaporeans perceive their own history to be little more than the Lee story with a bit of Sir Stamford Raffles thrown in for good measure.